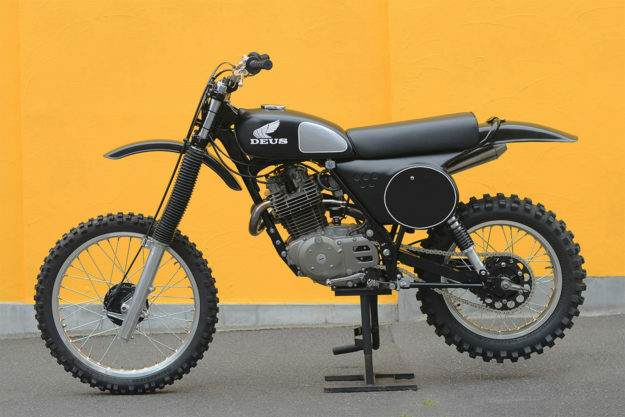 The Honda XL500 has achieved near-legendary status. Its front wheel is a ridiculous 23 inches, and it’s far too heavy for serious competition—but the engine is bulletproof and lives up to the old ‘stump-pulling grunt’ cliché. 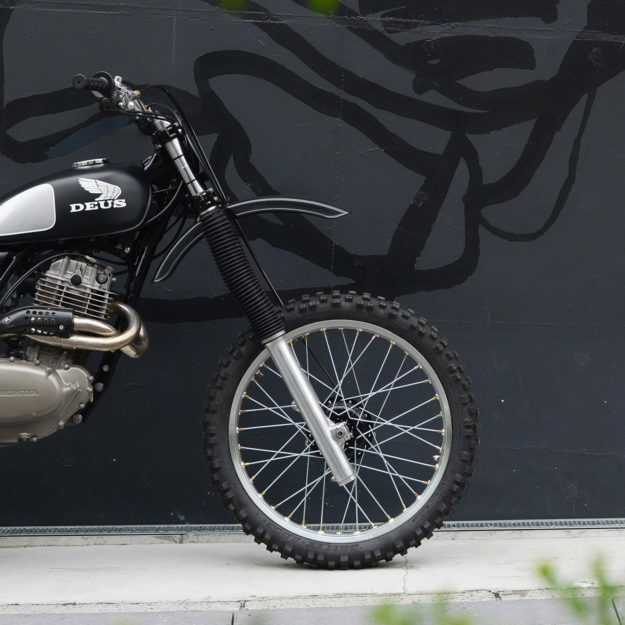 The guys at Deus Japan are fans of the XL500. So when they were looking for a street-legal machine to campaign in local vintage motocross and sand flat races, Honda’s big rig was high on the list of candidates. When Matthew Roberts, Director of Motorcycle Operations, got wind of a cleaner-than-usual example, he snapped it up. It’s the moto equivalent of a Clydesdale horse: easy to ride, but with bucket loads of torque from idle. 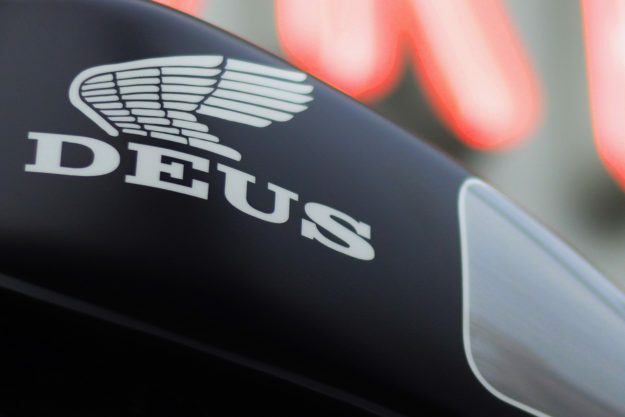 So Deus’ approach was to shed some weight and add more capable suspension. It would make the beast a force to be reckoned with, on- or off-road. Up front a set of late 80s XR600 forks have been grafted on. The stem and yokes were machined, so the steering bearings and headstock could be kept standard. A new subframe was built for cleaner lines, more wheel clearance and a better peg-to-seat height. 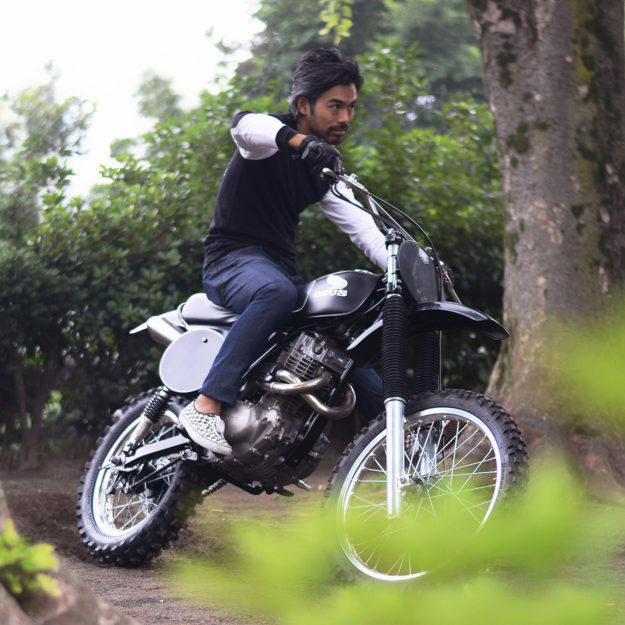 The swingarm is custom, but stays close to the standard wheel base—important for road registration in Japan. 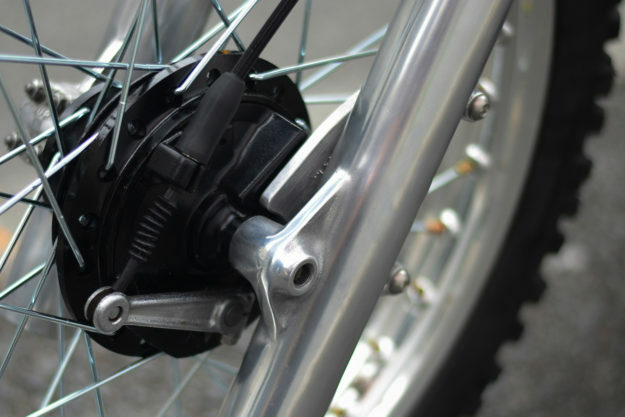 Alongside is an overhauled KLR hub and alloy rim—with a small cush drive to soften the hefty pulses of the 497cc single piston engine. The rear suspension geometry has been completely reworked, and now resembles a Suzuki RM more than a Honda XL, with almost 200mm of usable travel. Custom-made Ikon gas shocks and fork springs take care of road holding. “Radical suspension changes can sometimes be a bit of a black art,” says Roberts. 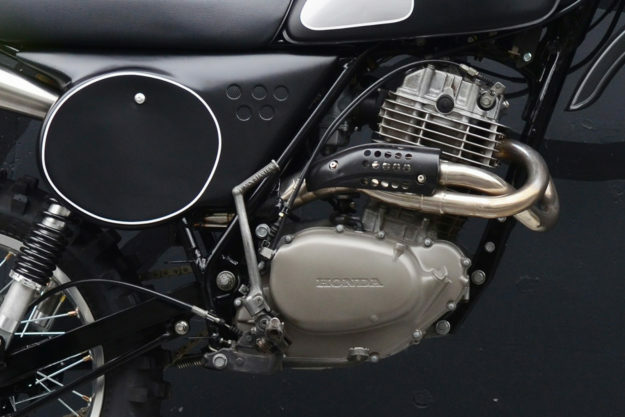 The standard carb is now fed through a K&N pod filter, and re-jetted to suit the one-off exhaust. 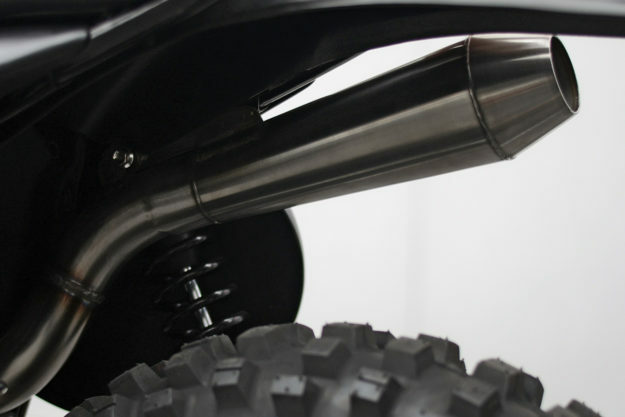 This features larger diameter headers mating up to a stainless megaphone nestled under the rear frame rail. Retaining the XL500’s bulletproof internals was always a priority, and race regulations forbid the usual go-to FCR carb set up. 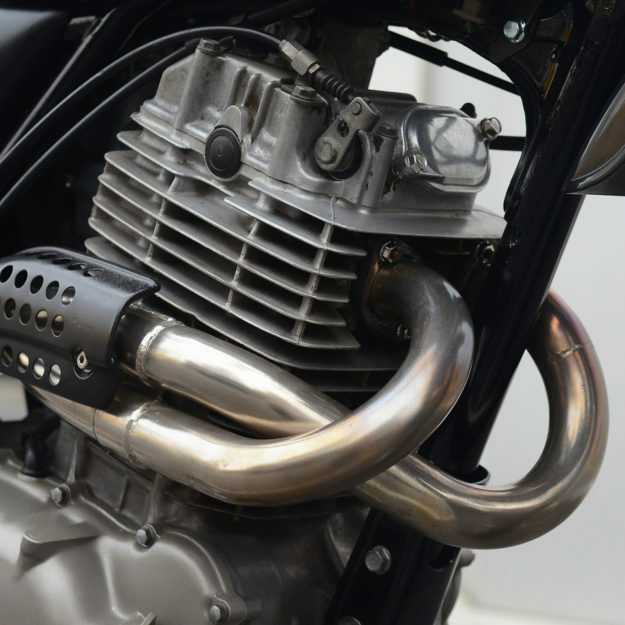 According to Roberts, the pipe ticks all three of the most important boxes: looking good, sounding great and riding hard. 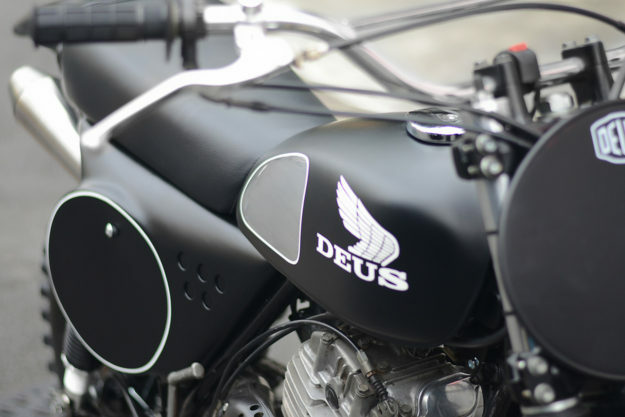 The seat base and side covers are one-offs in epoxy composite, shaped and created by Deus in-house. The saddle itself has simple period proportions. Mods to the frame proved to be more difficult—the XL500’s high headstock meant extensive reworking to get everything sitting right with matching lines. The paint is a little more extravagant than your typical race bike, with layers of vintage white, black and matte clear coats. 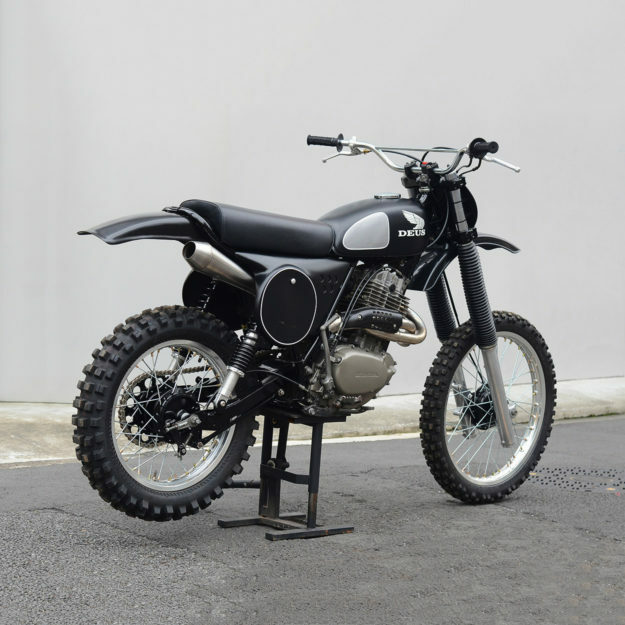 But the finished result sports a healthy dose of early motocross DNA in its aggressive lines. Black vintage race plastics round out the package. 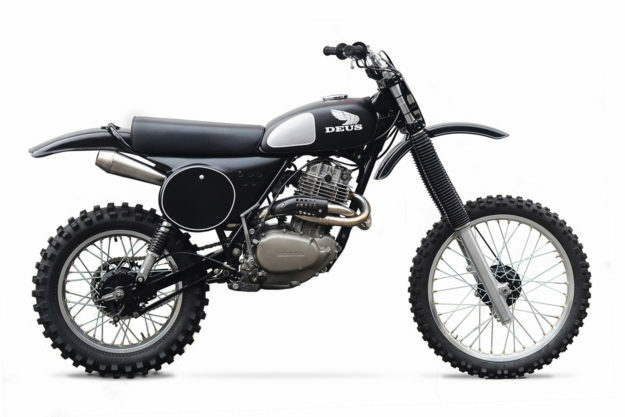 Christened ‘The Malachi Crunch,’ the XL500 is due for its enduro debut in late July—unless a buyer nabs the bike beforehand. 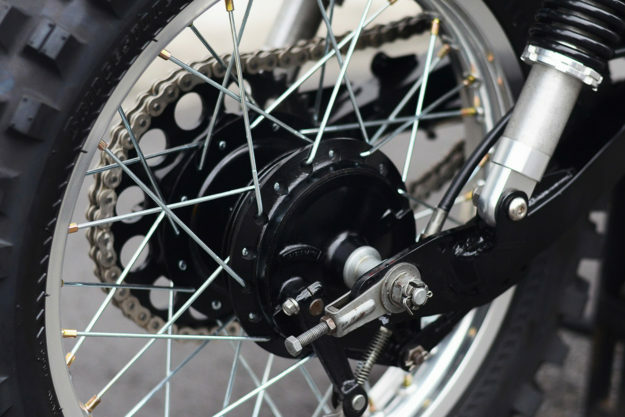 After the race, Deus will re-install dual sport tires and road-going gear—and lights. It’ll be just the thing for racing through the Tokyo streets on hot summer nights. Deus Japan | Facebook | Instagram | What is a ‘Malachi Crunch’?